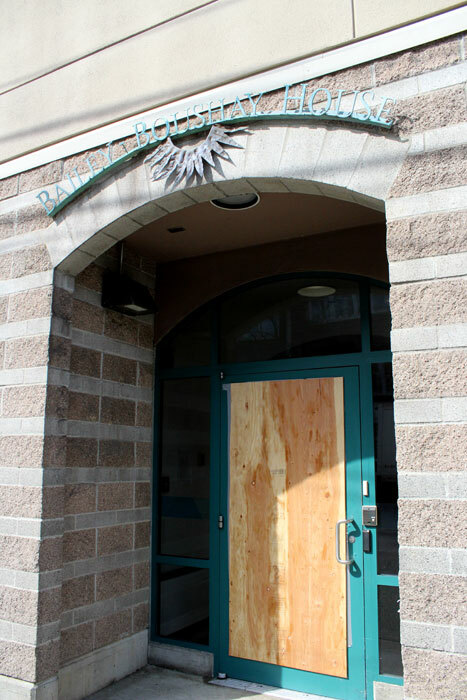 Photos by Brandon Macz: William M. McMillian, 33, is facing burglary and malicious mischief charges for allegedly smashing out several windows at Bailey-Boushay House, where he had been staying as a shelter guest, on Tuesday, March 19. Update: William M. McMillian pleaded not guilty on April 4 and will have a case-setting hearing on April 17. 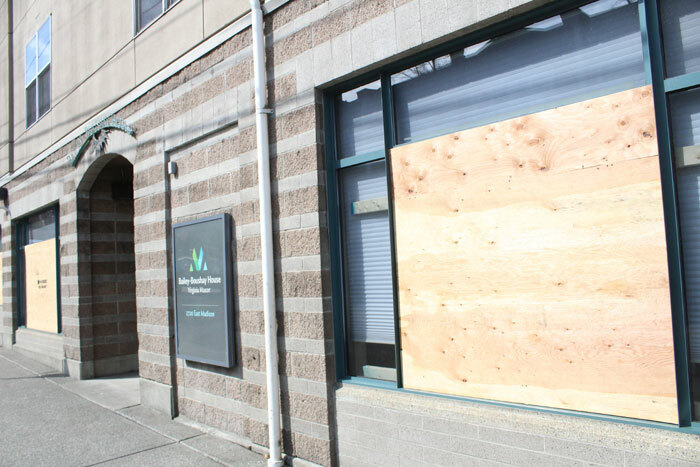 A 33-year-old man who had been a guest of Bailey-Boushay House’s emergency shelter is facing assault and malicious mischief charges after allegedly smashing several windows at the facility, smashing computers and striking staff when he was asked to leave on March 19. William M. McMillian was asked to leave the shelter after “he began to sexually advance on a resident,” according to a police report. The alleged victim stated that McMillian had harassed him several times in the past, and that night cornered him in the main room and “repeatedly berated [him] with vulgar and derogatory language,” according to the case investigation report. McMillian reportedly pushed past a security officer to regain entry to the facility and then pushed over a podium with a computer on top when staff attempted to block him from approaching other clients. He reportedly punched a security guard in the face, breaking his glasses, and then punched and kicked another staff member. “Nobody was seriously hurt,” said Gale Robinette, media relations manager for Virginia Mason Medical Center, which operates Bailey-Boushay House. McMillian reportedly went outside, where he’s accused of breaking eight windows, first throwing a rock through an administration office window. He allegedly reached inside the broken window and removed a computer monitor, smashing it on the sidewalk, according to the investigation report. He then allegedly threw a rock and kicked another window with his feet. McMillian reportedly threw a newspaper box through another office window, allegedly breaking yet another computer monitor he took from inside the social worker’s office. Back inside the lobby of Bailey-Boushay House, McMillian is accused of smashing a front-desk computer and breaking a water cooler before picking up a small table and throwing it through the backdoor window. Robinette said replacement windows have been ordered. King County Deputy Prosecuting Attorney Brent Kling writes in charges filed that a list of items damaged includes four computers, six monitors, six window blinds, a security podium, end table and water cooler. Robinette tells MPT the total damage at Bailey-Boushay House is estimated to be at least $10,000. McMillian was arrested near 28th Avenue and East Madison Street and booked into King County Jail. He is charged with first-degree malicious mischief and two counts of fourth-degree assault, and his bond is set at $10,000. He is set for arraignment on April 4. Bailey-Boushay House started in 1992 as a grassroots operation to serve individuals with HIV/AIDS, and it opened its 24/7 low-barrier shelter in November with funding from Mayor Jenny Durkan’s Building a Bridge to Housing for All legislation. The shelter was initially only going to operate through December, but additional funding was acquired to continue through 2019. Executive director Brian Knowles posted to Nextdoor about the incident. Robinette tells MPT that operations at Bailey-Boushay House are proceeding as normal, and that the shelter program will continue unchanged. There will be updates to emergency procedures and staff training.